Newly appointed Sri Lankan Prime Minister Mahinda Rajapaksa ended his five-decade-long association with Sri Lanka Freedom Party (SLFP) and joined newly-formed Sri Lanka People's Party (SLPP). SLFP was founded by his father Don Alwin Rajapaksa in 1951. Rajapaksa's joining SLPP signals that he will contest snap polls, under his own party banner and not that of President Maithripala Sirisena's Sri Lanka Freedom Party (SLFP). SLPP was formed in 2017 by Rajapaksa's supporters as platform for his re-entry into politics. In February 2018 local council elections SLPP won two-third of total 340 seats. In January 2015 Presidential election, then President Mahinda Rajapaksa (who was in office for a decade from 2005) was unexpectedly defeated by his then deputy Sirisena with support from Ranil Wickremesinghe's United National Party (UNP). But, power-sharing arrangement between President Sirisena and PM Wickremesinghe in later times became increasingly uncertain on several policy matters, mainly on economy and security. Further rift had developed between them over policy towards China and India, with Wickremesinghe favouring Indian investment as counter to Chinese inroads in Sri Lankan infrastructure projects and Sirisena's intention to contest 2020 presidential election under Mr Wickremesinghe's party. In October 2018 Sirisena had abruptly removed Wickremesinghe and replaced with Rajapaksa, a pro-China strongman as new Prime Minister. This move had plunged Sri Lanka into political and constitutional crisis. 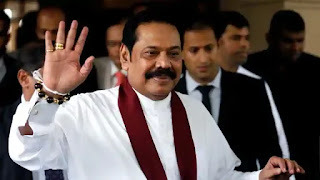 Sirisena had suspended parliamentary proceedings and later dissolved it, after it became evident that there is not enough support in House to prove Rajapaksa's premiership. Q. Newly appointed Sri Lankan Prime Minister Mahinda Rajapaksa ended his five-decade-long association with Sri Lanka Freedom Party (SLFP) and joined which newly-formed party?